Rookie in the world of darts? No worries, we’ll guide you! What is your MICO-factor in darts? Play 5 times and see how good you really are! Welcome to the New GoDartsPro! 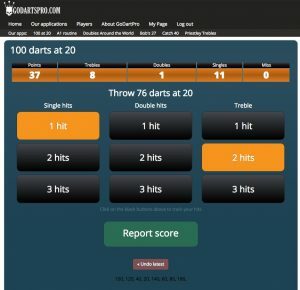 Since the launch in September 2017 we’ve added many great darts practice games and functionality to improve your play. Now we’re proud and happy to present you Mikko Laiho and his brilliant new concepts – the MICO-Factor and the GoDartsPro MasterClass! We offer a vast amount of tools for getting your darts better. But we can’t do it for you. So be persistent, believe, enjoy and do the work required. We have developed a fantastic and simple way to measure your skill level. It is a very clear indicator, but for the majority of the darts players someone counting our averages is just a dream. Play 301, 501, 1001 against a friend or our computer opponent with 20 levels. There’s even a trash-talk option to prepare you for cheating opponents (or just for fun). Try our 501 darts scorer now! Meet our darts practice guru Mikko Laiho! Mikko Laiho is GoDartsPro’s new Darts practice-expert. 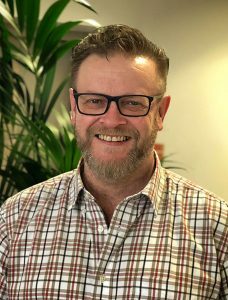 He’s been working with different projects with Winmau for several years and has been coaching all level players – from beginners to World Champs – in the game and has the best pedigree in the World when it comes to darts practice and game improvement. He was Finnish number one when he was still doing the circuit. Mikko’s focuses to bring proper, programmed and interesting darts practice to every single player in the World, and as you’ll see across his content we’re sure that he is the finest darts practice guru in the world. Mikko will publish darts practice articles and a video-diary on GoDartsPro on a regular basis so join now and stay tuned! How much should you practice at darts? How often should I practice darts? Get ready for GoDartsPro MasterClass! level hopping practice game in darts. GoDartsPro is made by darts players for darts players. Simple and effective darts practice games designed to use with tablet or smartphone. Large buttons for easy marking and with a voice telling you the score. 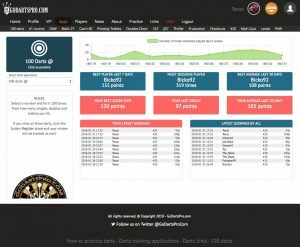 GoDartsPro was made to fill the needs for darts practicing applications to track the scoring progress. Aiming for PDC or just playing with friends? Our darts training games will make your darts practice better. Join this growing darts community! We’re all here for the love of darts! Want to improve and get better in darts? 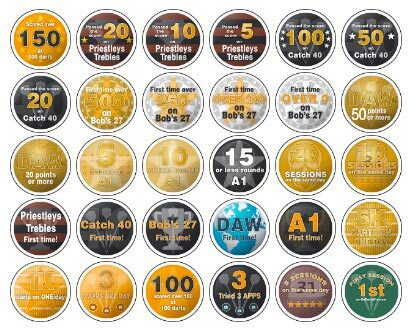 Unlock achievements along the way you get better in darts and try our different applications. A fun way to practice and track your progress in darts while trying to master this sport. The more you practice darts and the better you score the more badges you will unlock. Why practice darts in a structured way? Knowing how to practice darts efficiently is crucial to improve your skills. Darts is a lot about muscle memory and therefor it’s better to practice darts one hour per day than seven hours one day per week. Did your second dart automatically followed your first dart – even if you were aiming somewhere else? That’s muscle memory and that’s why it is so important to make your first dart count. With this knowledge we’ve created and added practice applications that rewards the importance of groupings and scoring that first dart. We have practice applications to improve your scoring to reach for those 180’s. Have you ever scored a 180? We teach you how to do it! “One of the best ways ever how to score your initial 180 is fairly simple. But high scoring is nothing if you can’t finish a game. We have applications to practice those important outs as well. Make your practice sessions intense, focused and emulate a competitive environment as much as you can. But never ever forget that you need to enjoy your darts!